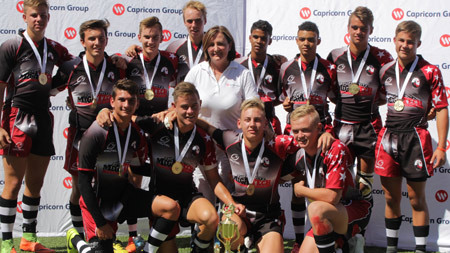 The groundbreaking Capricorn Group International Junior Sevens Rugby Tournament was once again held at the Windhoek Gymnasium Private School on 9 and 10 March. The game of sevens is known for its fast-pace with a great spirit from the spectators. The event was characterised by a huge success and an excellent experience, that show-cased exhilarating junior sevens rugby talent, which the group hopes will continue to be a highlight on the local and international sporting calendars. Capricorn Group affirmed again that they are proud to be the title sponsor of the tournament, when Thinus Prinsloo, the group’s Managing Director, indicated it in his speech at the event. “It reflects our group’s focus on creating sustainable opportunities in the regions and communities within which we operate. This includes the development of youth for the future of the countries in which we operate, and sport is a powerful mechanism to achieve this. Although our group’s beginnings are deeply rooted in Namibia, we are a regional financial services player, specifically in Botswana and Zambia. I am therefore excited to see that the teams from Zambia and Botswana have made the journey to Namibia to participate in the tournament this weekend,” Prinsloo said. Three of the Capricorn Group entities supported the tournament. Bank Gaborone, sponsored the International U/19 Botswana Sevens Rugby Teams’ Jerseys, Cavmont Bank sponsored travel costs of the International U/19 Zambia Sevens Rugby Team to Namibia to attend the tournament, and Capricorn Private Wealth hosted the VIP area at Windhoek Gymnasium Private School, who is also the host and partner of this collaborated event. Apart from Capricorn Group, other sponsors include Trustco Group and Kosmos Radio.